Natural polymers are the polymeric derivatives of plants and animals sources. They include copolymers which contain synthetic compounds, namely starch and fermentation products, cellulose ethers, vegetable gums, protein based polymers, and marine polymers. The demand for natural polymers in the U.S. has been increasing at a healthy CAGR due to increased consumption expenditure, construction activity, and nondurable goods shipments. The increase in demand for natural polymers in the medical industry has been driven by growing applications in osteoarthritis and pharmaceuticals treatments. Natural polymers outperform their synthetic counterpart in terms of environmental footprints. However, they significantly lack behind them in terms of cost, availability of raw materials, product inconsistence and supply uncertainties. The U.S. natural polymer market has been mainly driven by the increase in demand for non petroleum based and eco-friendly products. Natural polymers have been gaining popularity due to their growing demand in pharmaceutical applications such as excipients, binders and fillers in directly compressed drugs, wound dressing, treatment of arthritic-afflicted joints, etc. The demand for natural polymers in the U.S. has been increasing at a healthy CAGR due to increased consumption expenditure, construction activity and shipments of nondurable goods. The increase in demand for natural polymers in the medical industry has been driven by growing applications in osteoarthritis and pharmaceutical treatments. Natural polymers outperform their synthetic counterpart in terms of environmental footprints. However, they significantly lag behind them in terms of cost, availability of raw materials, product inconsistence and supply uncertainties. With over 37% share of the total natural polymer consumption in the U.S. in 2012, cellulose ether was the most widely consumed natural polymer in the U.S. market due to high demand from the pharmaceutical, toiletries, cosmetics, construction, and food and beverage industries. Methyl cellulose led the cellulose ether polymers segment, while starch and fermentation products accounted for the second largest market segment in 2012. Further, this segment is expected to exhibit the fastest growth in terms of both volume and revenue due to rapidly growing demand from the packaging industry. The U.S. natural polymer market revenue was USD 4,646.0 million in 2011 and growth at a CAGR of 6.2% is expected from 2012 to 2018. Medical, oilfield, food & beverages and others including packaging, cosmetics and toiletries, adhesives, construction, paint and inks, and textiles and leather tanning are the major applications of natural polymers. 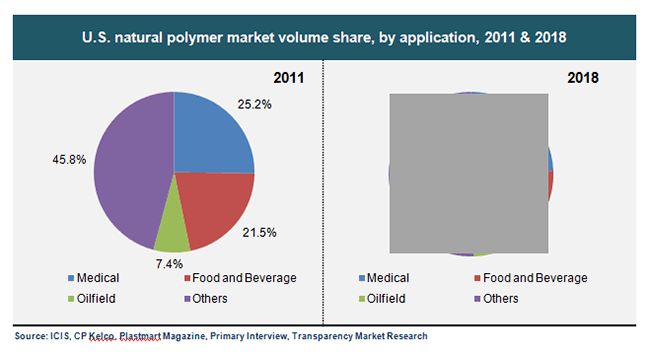 In 2011, medical accounted for 25.3% of the total natural polymer application in U.S. The spur in the demand is due to the rise in the pharmaceutical application and osteoarthritis treatments. Food & beverage is the second largest segment which accounted for 21.5% of the total natural polymer application market share and it is expected to decrease to 18.2% based on mature applications. However, stringent environmental regulations imposed by governments, and growing awareness about deforestation and protection of animals are acting as barriers in the growth of the natural polymer industry. Moreover, easy availability of substitute products like synthetic polymer is also anticipated to arrest the growth of this market. The market for natural polymer is fragmented as the top four companies contribute less than fifty percent of the total market share. The market is significantly integrated through raw material, polymer manufacturing and application development of these polymers. The market is highly price sensitive and experience frequent price wars in order to gain competitive advantage. Key market participants include Ashland Inc., Dow Chemical, Economy Polymers & Chemicals, JM Huber, Novamont, Archer-Daniels-Midland (ADM), Plantic Technologies, Cargill Inc. an others. Natural polymers that either occur naturally or are obtained from biomaterials such as cellulose, chitin, DNA, silk, and protein account for about 1% of the 300 million tons of plastics produced every year. Natural polymers are inclusive of copolymers that contain synthetic compounds, such as starch and fermentation products, vegetable gums, marine polymers, cellulose ethers, and protein-based polymers. In the U.S., elevated consumption expenditure, nondurable goods shipment, and rising construction undertakings are leading to increased production of natural polymers for these purposes. Products and applications are the two main criteria by which the U.S. natural polymers market is divided. Each of the segment is further sub-segmented and estimates and forecasts provided for each subdivision. The research report interprets and evaluates the dynamics of the natural polymers market, including drivers, opportunities, restraints, and challenges to the industry. Using primary and secondary research sources, various entities in the overall value chain of the natural polymers market are presented in the report. Hence, the report serves as valuable tool for business strategy making for various entities such as buyers, raw material suppliers, distributors, and new entrants into the market. Natural polymers are finding large-scale application in nondurable goods shipment, pharmaceuticals, and food and beverages. With shipments of these products exhibiting an upward graph, the demand for natural polymers in the U.S. is expected to be rising as well. As such, the demand for natural polymers was valued at US$4.95 billion in 2012 and is estimated to reach US$7.12 billion in 2018, growing at a CAGR of 6.2% from 2012-2018. Environmental concerns and demand for non-petroleum-based eco-friendly products stand as the major factor driving demand for natural polymers in the U.S. Use of natural polymers for pharmaceutical applications such as excipients, wound dressing, binders and fillers for directly compressed drugs, and treatment of arthritic joints is also boosting the market. Natural polymers outdo synthetic polymers in matters of environmental sustainability; however, these polymers are vulnerable to pricing uncertainties in raw material and other supplies, and are not as cost-effective as their synthetic counterparts. By application, medical applications dominated the market with a 25.6% share in the overall market in the U.S. in 2012. This is mainly attributed to the high demand for these polymers for osteoarthritis treatments and pharmaceutical applications. Food and beverages stands as the second largest application segment. It held 21.5% of the total market, but its share is estimated to reduce to 18.2% due to the looming maturity of the natural polymers market in this application. Amongst the products, cellulose ether registered maximum consumption, accounting for more than 37% of the total consumption of natural polymer in the U.S. This is mainly due to elevated demand from the pharmaceutical, cosmetics, food and beverage, toiletries, and construction industries. The methyl cellulose sub-segment held a dominant share in the cellulose ether polymers segment. Starch and fermentation products accounted as the second segment amongst all products in 2012; rising demand from the packaging industry will lead this product segment to exhibit the fastest growth in the coming years. Ashland Inc., Economy Polymers & Chemicals, Archer-Daniels-Midland (ADM), Cargill Inc., Dow Chemical, JM Huber, Plantic Technologies, and Novamont are key market participants in the natural polymers market in the U.S.